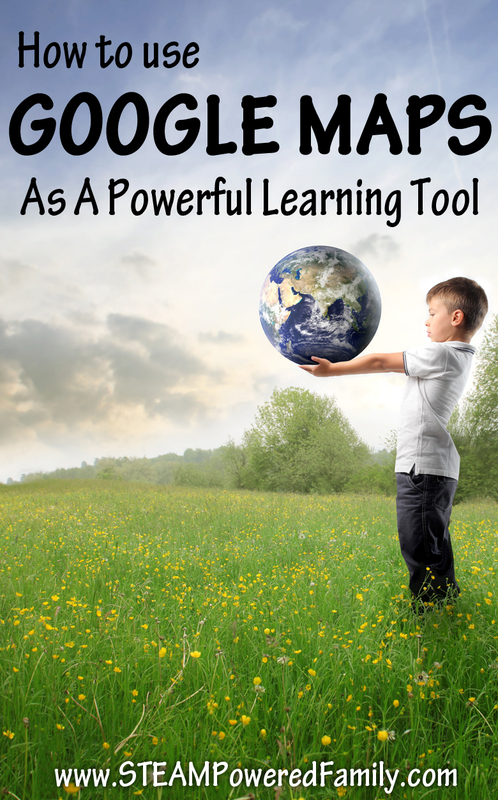 Google Maps as a powerful learning tool. Perhaps this sounds a little strange to you. I mean isn’t Google Maps just for figuring out how you are going to get to your destination? Or maybe you use the traffic features to check your commute before leaving the house. But have you ever thought about how you can use Google Maps as a powerful learning tool about the world, geography and culture? And so began our fascination with Google Maps. We use Google Maps regularly in our lessons. It’s a favourite with my boys and, I admit, I enjoy our time “traveling” the world together. See I would LOVE to become a worldschooler, taking my children around the world on great adventures, learning cultures and languages and geography by experiencing it. The reality is that we are mostly at home and our dreams of traveling the world are limited to only a week or two each year. So what can we do at home? Well we have our wall map that we study regularly as we learn about new countries and cultures. We read books and chat often about different parts of the world. And when we chat about one country, after finding it on the map and chatting about what we know of that country (perhaps referencing text books or other books), it’s time to experience the place in more depth. You Tube is an obvious choice for checking out videos and shorts about a place, but sometimes it can be hard to find quality pieces that are age appropriate. Also, since we are not American, a lot of the good videos are not available to us. In comes Google Maps. Through Google Maps we can learn about a country, it’s bordering nations and geography, it’s cities, landmarks, architecture, and even some of their customs and culture, such as language and how they dress. As an example, we are currently studying Mexico. So after reading a few books, mapping and doing some exercises to learn about Mexico we load up Google Maps. I usually zoom out until we are looking at Earth from space. It’s really fun to spin the Earth around and around as the boys try and figure out where on the Earth is Mexico. In this way, they are also learning how to recognize landmasses, oceans, continents and more. Eventually they find Mexico, sometimes with a bit of help, and they start to zoom in. Tip: Make sure satellite images is on! My boys zoom around Mexico looking for various cities, cool features, and landmarks. Perhaps finding ones we just read about in one of our books. As they move about, Google Maps offers photos across the bottom of the screen of major landmarks that they can check out. These are usually high quality, professional photos that are quite stunning. Then they zoom in closer and closer. Making more discoveries. Perhaps a heart shaped lake or a volcano. Then they hit streetview. This is where the excitement really gets going. My children love “walking the streets” and seeing the way people are dressed, what they are doing, the names of different shops (and the languages on the signs). Even the architecture of the buildings or street art has become a topic of conversation. The things they find are a fascinating glimpse into life around around the world. You can even enter some of the buildings and don’t forget to Google for hidden Easter Eggs. Google loves to have fun and there are some great Easter Eggs you can search for, including a Doctor Who one! My children found people changing flat tires on a side street in Brazil. They have wandered the streets of Havana looking at the amazing architecture and cars. They have studied signs in Paris, the writing in French, that we have translated to English. They have walked along beaches watching people parasailing and suntanning while we are in the depths of winter here at home. Discussion points as you explore the world! These are just a few of the questions I ask the kids as they explore. Do you think it’s a warm place or cold? Do they do a lot of driving or walking? Are the kids wearing uniforms to school or street clothes? Do you see anyone eating? What do you think they are eating? How are the buildings different from what we see here? And any other questions that help my kids analyze the photos, these brief glimpses into another world, and learn a little bit about what life might be like in these distant destinations. Ask your kids a question, like: Where in the world do you think it is snowy? Then have them zoom around Google Maps to see if their guesses are correct. I would love to trot around the world with my children. I believe our world has so much to teach us and that we learn best by doing and experiencing. But since hopping a plane each day for a new adventure is not in the cards, Google Maps provides some pretty powerful and awesome opportunities for learning. An amazing new feature on Google Maps is the ability to explore space. This includes information on a variety of planets and moons and even a street view of the International Space Station. Seriously cool learning! Happy globe… and space… trotting!